Brother International Corporation, which was established in the United States during the year 1954, is one among the premier providers of wide range of products for home and office. Brother is well known for providing facsimile machines and electronic labeling systems and is synonymous with success in the development of innovative and award winning sewing machines for the fashion industries. Brother cs6000i 60-Stitch Computerized Sewing Machine with Wide Table is such an amazing product from the hands of the global leader in sewing machine development. 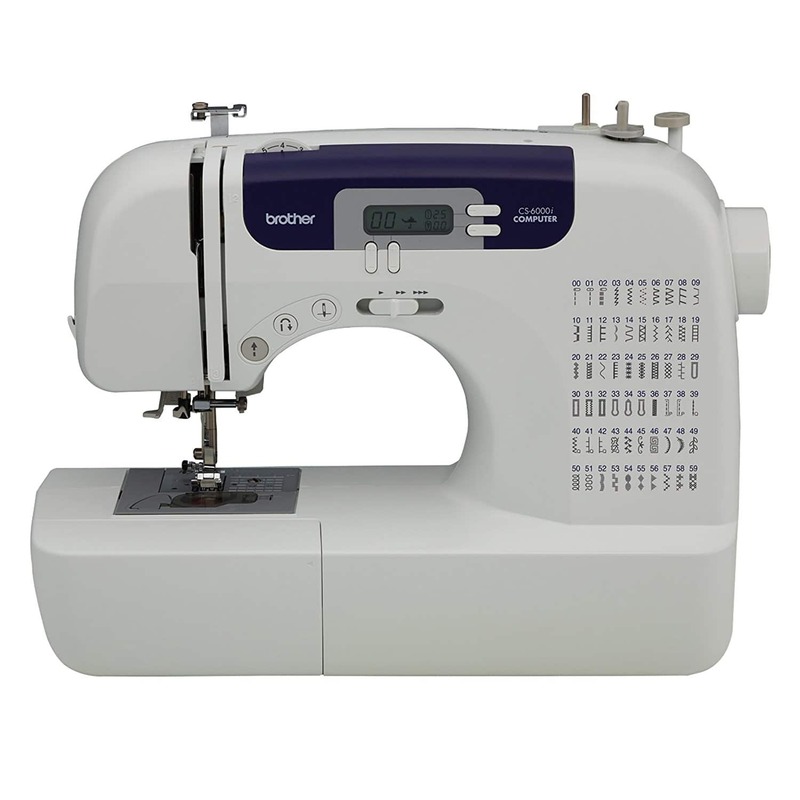 Brother sewing machine is absolutely user-friendly and has a portable design. It has been built with an automatic needle threader. You can use the start/stop button with much ease which would eliminate the need for your foot control. The system is in-built with 60 sewing stitches that would include 20 decorative stitches, 20 stitches for garment construction, 7 quilting stitches, 6 heirloom stitches, and 7 auto-buttonhole styles. This sewing machine set comes with an oversized table in order to carry out larger projects. The machine set comes with a hard carry case. Unlike SINGER 7258 Stylist, this product do not contain LED display screen. However, this sewing machine will come to your hands with an easy to view and easy to use backlit LCD display. As this machine comes with 25-year of limited warranty and free phone support for the life of the product. So you need not worry about the machine’s durability. Stitch Selector: This sewing machine has an easy to use LCD display stitch selector which will make it easier for you to select your desired stitch with the touch of a button. You can be able to see the stitch you have selected on the screen thereafter. Sewing Speed: You can have a complete control over the sewing speed by the help of stitch speed slide. Threading Made Easy: You can make the threading in no time by simply following the numbered diagram that has been printed on the machine. Accompanying Table: You can very well make use of the over-sized table that is accompanying with the sewing machine for quilts and any other larger projects. The table will provide you with an additional space that you require to maneuver your projects. Portability: This sewing machine can be easily transported from one place to the other with much ease by packing the machine in the hard carry case provided with this. Automatic Threader: This sewing machine has been constructed with an automatic needle threader by the help of which the machine will be able to push the thread. You will have to just touch the lever that is provided on the side. Work Area: You will be provided with easy to use and super bright work area which will be very useful when you have to sew the dark fabrics. Bobbin Winding: This sewing machine comes with a jam-resistant and quick set-top drop-in bobbin. This will make it easier for you to set and access your bobbin thread. There is a diagram printed on the machine which will show you where to place the thread. Free Arm: Brother sewing machine has been in-built with free arm for sewing cuffs and sleeves which will be perfect for sewing sleeves and any other cylindrical items. The sewing machine reviews reveals that the Brother sewing machine is more versatile and value-packed which makes it perfect for a wide range of sewing as well as quilting projects. This machine has been designed in a way to help you get started quickly with all its automatic features. Also, the product comes with many advanced features by the help of which you can add decorative stitches to a sleeve and sew a zipper on a custom-fitted skirt. This machine comes with as many as 27 stitches that are designed specifically for sewing. 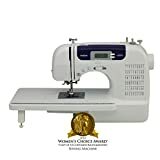 Some of them are: Overcast and zigzag stitches, basting stitch, triple stretch stitch, blind hem stitch and buttonhole stitch by the help of which this sewing machine provides a great way to start sewing for both beginner and experienced quilters. This sewing machine would operate quietly and the resultant stitches would be nice and even. The machine is very easy to use and you can sew easily through a wide variety of fabrics. Brother sewing machine comes with extra features like additional presser feet, the over-sized work table and hard dust cover. These are the tangible goods that you will have to buy separately in case of other sewing machines. One of the most important advantages with this sewing machine is its unbelievable low price. At the price range of $150, this workhorse comes with a full set of accessory feet. This sewing machine requires low maintenance. This machine doesn’t need to be cleaned more often. The range of accessories is another advantage. The accessory feet include: Walking foot, spring action quilting foot, over-casting foot, monogramming foot, zipper foot, zigzag foot, blind stitch foot, buttonhole foot and button-fitting foot. The accessory pouch include: (1) seam ripper, (2) needle, (3) cleaning brush, (4) screwdriver, (5) spool caps, (6) spool pin, (7) bobbins and (8) eyelet punch. This sewing machine also comes with a bilingual user manual which will make it easier for you to start using the machine. The only disadvantage with this sewing machine is that there is no cap on the thread spool which will make the thread to pop off if you are sewing at higher speeds. You may not be able to sew very fast because of this. With only a minor disadvantage, Brother CS6000i is undoubtedly a good and inexpensive sewing machine of recent times. If you are intending to purchase a full function machine that comes with lots of features, then this is the best choice for you.